Published at 07/05/2017 18:57:11 from Argentina, 10040 visits. 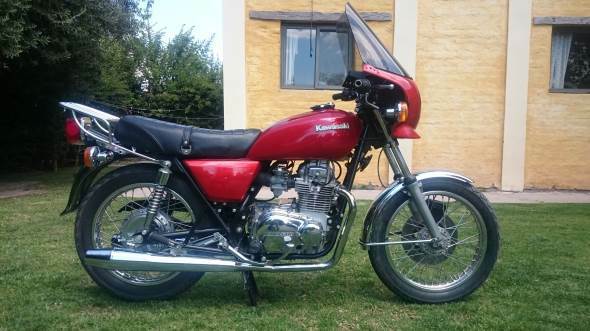 Moto Kawasaki KZ400 model 1977. Incredible overall. The bike is based in Buenos Aires with roles in order to initiate transfer procedures. Bought second hand in 1983; new with all original made between the year 1983 and 1985 and never again take to the streets. In the year 1989 brought to Mendoza, where he was saved until last year. Tank, commands and headlight are not the originals because they stole them to the previous owner of your home in the year 2014. I personally dismantled the original wrappings of exhausts, mudguards and side. Also lights and guiñes back and guiñes front. I have replacement pistons and original rings. In the photos, the grill and the front fairing are only presented.